There are three cenospheres near the center of the image. The darkfield top light shows their Reflectivity. The black, tapered cylinder is a tire wear particle. Road dust minerals complete the assemblage. 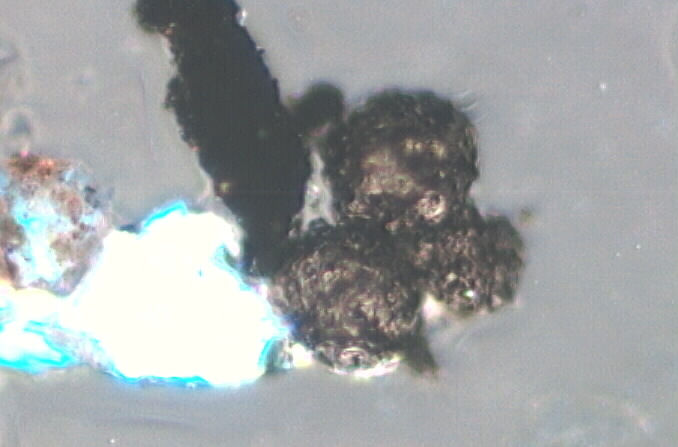 Road Dust is an assemblage rather than a single particle type. An assemblage is characterized by a set of particles of different types, in this case, tire wear, engine emissions, and natural minerals. Each of these particles have multiple sources but when found together indicate relative proximity of roads. Road Dust indicates proximity to roads and the size, shape, and blend of assemblage members helps indicate the type of road, the type of traffic on the road, relative distance to the road, and volume of traffic. The most characteristic particle of this assemblage is tire wear. Occationally an asphalt coated mineral grain will be present. The cenospheres tend to be small because mobile diesel engines are much smaller than the large fixed boilers of power plants or large ship. Wear metals, nitrate aerosols, and exhaust corrosion products can also be part of this assemblage. The mix of Road Dust with pollens, spores, insect parts, plant parts, and other "exterior" particle types helps to characterized the nature of the exterior environment and entry path of the particles. Garages under a building, open windows, and door access directly from the street all have different mixes of particle types. Though these mixes overlap, multiple samples from the same site can often help differentiate these conditions.